"Sticks and stones may break my bones, but words will never hurt me." While this popular saying promotes strength in the faces of ridicule, it fails to recognize a very real danger to children heading back to school. Words DO hurt, and the impact of being bullied has lasting effects on the development of children that can be seen years later. Students who are bullied often dislike school and have lower academic achievement. They are also more likely to grow up with lowered self-esteem leading to increased risk of depression and, in extreme cases, suicide. 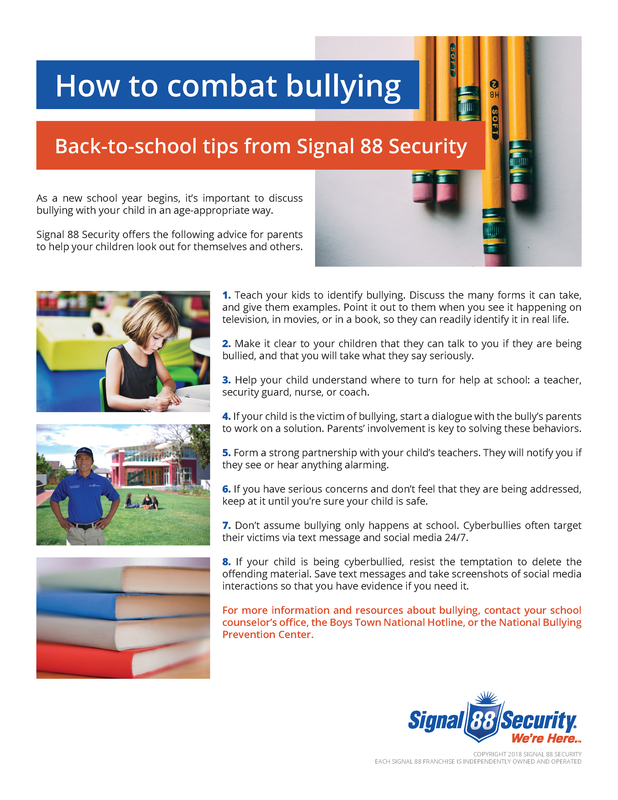 Follow these eight tips from Signal 88 Security to help your children learn the most effective ways to recognize and combat bullying when they see it at their school. To download our 8 Tips for Combating Bullies flier, click here. For more information on bullying, contact your school counselor, National Boystown Hotline, National Bullying Prevention Center or another local resource.